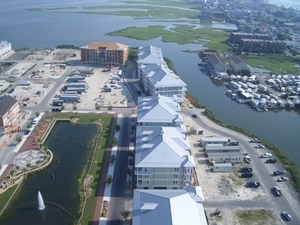 Sunset Island, a Natelli Communities/ADC Builders Joint Venture Project, is a 590 residential unit bay front community with recreational facilities and interior commercial space. The project includes a community pool, interactive fountain, community store, club house & community center and incorporates interconnecting paths and walkways that encourage pedestrian movement to reduce vehicular traffic. Every residential unit is within walking distance of all amenities, and viewscapes are strategically located along the paths. Beach areas have been restored and improved to ensure the project is both environmentally friendly and available for recreational use. GMB worked in partnership with the developers to guide the project through its many planning, engineering, and construction phases. GMB’s engineering design services included streets, curbs, gutters, drainage, stormwater management, water/sewer, landscaping, parking layouts/design, and related services. GMB provided the state and local expertise needed to facilitate environmental, regulatory, and utility approvals.